A repair kit to help fix a vehicle hit hard in the front which is cut behind the A-Pillars. See item description for details. Contact a sales representative for items noted "See Assembly List." Shipping address must be a business with a dock or fork lift. Wiring which connects to the front lamps. A L 3/4 front end assembly is less the right fender, right fender liner, right marker light, and may have issues with the right apron where either part or all of the apron is not useable. A L 3/4 front is not to be confused with a front end needing a right fender. The key difference is that the latter does not have any inner structure issues. A R 3/4 is the same but with damage on the opposite side. 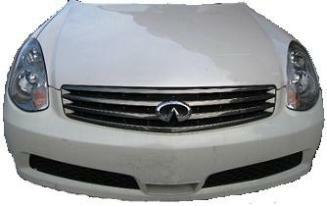 Most front end assemblies do not have a front bumper cover that is insurance quality. No refunds will be issued for bumper cover issues. The lower spoiler and/or lower valance is not guaranteed. Normally front end assemblies come with several bolts, screws, clips, and brackets which make a difficult repair job a little easier.